VATICAN CITY – For Mike Ritucci of Towson, the Mass of Thanksgiving celebrated May 2 for the beatification of Pope John Paul II was one of the most inspirational and awesome experiences of his 72 years – physically, emotionally and prayerfully. “I was moved by what I saw and heard,” he said. 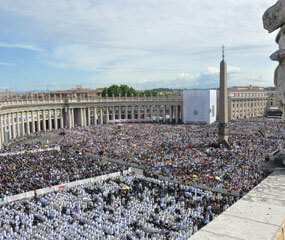 Due to the huge crowds for the May 1 beatification Mass, estimated at between 1 million and 1.5 million, some pilgrims, including Ritucci, were unable to get close enough to St. Peter’s Square or even the Via della Conciliazzione to see the Mass or receive Communion. Arriving early for the smaller Mass the next day, a group of pilgrims from Maryland and several other states coordinated by The Catholic Review and other Catholic newspapers, got seats within the first 20 rows for the Mass, and were able to receive Communion. Ritucci was impressed that despite the tens of thousands present, the people were reverential. Two of Ritucci’s friends suffer from Parkinson’s disease, the same affliction that claimed the life of Blessed John Paul. He promised to pray for them on this trip. He also came because his wife, who died five years ago of a brain tumor, had a great dedication to John Paul, and prayed for his intercession frequently during her illness. He hopes to receive great graces from the pilgrimage, including a plenary indulgence – which to his memory he has never in his life received. “I want to be closer to God and closer to my Catholic faith,” he added. He also wants to bring his experience back to Maryland and share it with others, especially as a substitute teacher at Immaculate Conception School in Towson. Seminarian Chris de Leon, a first-year theology student for the Archdiocese of Baltimore at the Pontifical North American College, a seminary for students from the United States in Rome, had better luck getting to the beatification Mass May 1. He and his parents got to the Via della Conciliazione around 5:30 a.m. and found a spot near the first large video screen. When St. Peter’s Square opened, the crowd on the street started moving forward and still around 9 a.m., they were still heading into the square. “We could have gotten in, but we decided to stay where we were,” he told The Catholic Review. He said the view from a helicopter shown on the video screen during the Mass showed the crowd stretching all the way down the street from St. Peter’s to across the river. For more on the beatification and pilgrimage, visit CatholicReview.org/guntyblog.